Recently, I visited the town of my father's birth...Johnstown PA. Sadly,he passed away in January 2010 at the age of 86. My childhood is filled with so many Johnstown memories;freshly baked cookies and pies, fireflies in the summer skies and of course, a ride on the Incline! 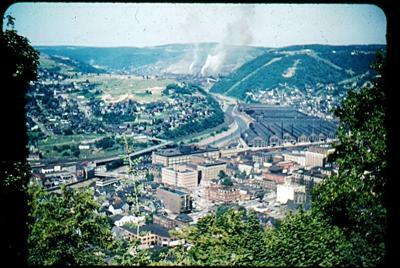 I took several photos down the the Incline this past summer, and then upon my return home to Albuquerque NM, I realized that I had some old photos from the 1950's 60's of the greater Johnstown area which were taken from atop the Incline! So, here you go...ready for the ride? .....I would like to share the J'town beauty, clean and smoggy! Still my Johnstown! 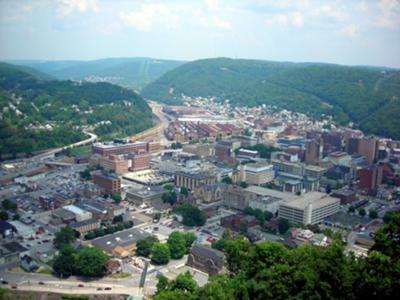 My lovely Johnstown. Good to see that it has cleaned up the act. Notice a difference between the two photos--- decades apart....(the smoke stacks in the background), and the clarity of clean air in the same background today. Our parents drove the family up and through old Route 66 to my father's hometown every summer in the 50's and 60's-- until my beloved grandmother passed away in 1968. The aerial view of the Johnstown area is much interesting. I am interested in photography and travel and would like to know how you managed to get such an awesome aerial picture. Ple3ase share more so that I can know. Thanks for sharing your pics of Johnstown. Though the "fog" is now gone, so are the jobs, thus leaving Johnstown a city infested with blite and drugs. Keep your warm memories, but realize thats just what they are ... memories of a place that is no more. Thank you so much for sharing your photos and wonderful memories of Johnstown, your dad, and grandfather. I can feel the love you have for our part of the world in your writing. I hope you will still find reasons to visit again and enjoy the memories you charish so much. Johnstown really is a special community. I believe it's because of the historical events that took place and generations depended on each other and the legends passed down. I love visiting Johnstown, I love the people there, they always make you feel like family. I'm sure you feel that whenever you come home.